Wooden needle keep that is cleverly decorated with a full color label of the "Bee Keeper's Sampler". 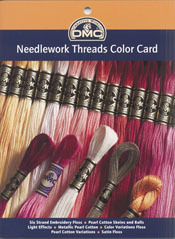 Needle keep also includes 6 Bohin tapestry brand needles (3 of size 24 & 3 of size 26). The needles best suited for cross stitch! Makes a wonderful little gift for your stitching friends! 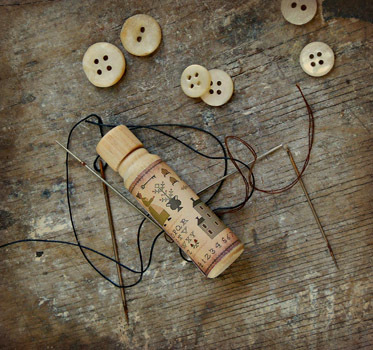 Keep your needles sharp and you thread from twisting with the use of beeswax. Quilters have used beeswax for centuries for this very purpose. A label featuring, the Bee Keeper's Sampler is tied around the 3/4" x 3" bar of wax with waxed linen and a tiny skeleton key. 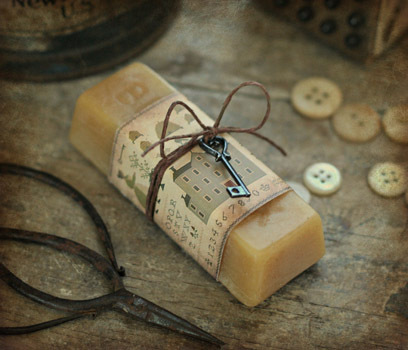 Wax is supplied to us by a Ohio beekeeper. Wax colors will vary slightly, depending on what the bees feed upon. 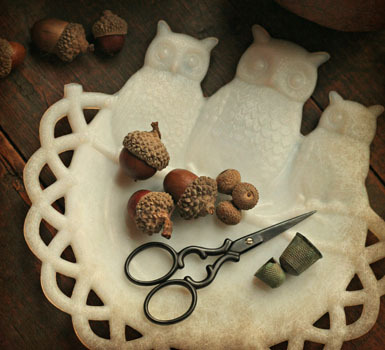 A cute little piece to use or just enjoy as a decorative ditty. A wonderful piece! 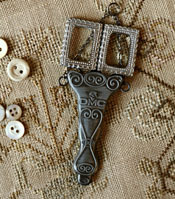 A decorative scissor and scissor holder hangs from a 33" silver chain...a stitcher's dream! 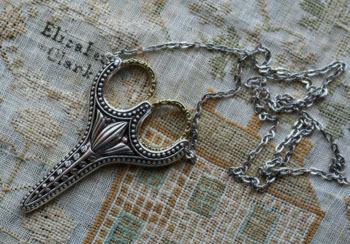 Piece includes an ornate 3 1/2" scissor. 12 page printed color card, helpful when choosing floss selection or to use as an aid when doing a floss conversion. 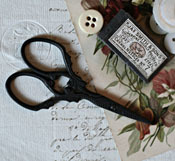 Vintage styled scissor case holds up to a 4" length embroidery scissor. 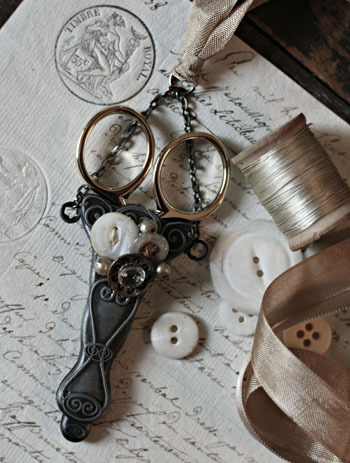 Click on photo to view a decorating idea of the case...glue on a few vintage buttons and pearls and attach to a piece of silk ribbon for a lovely chatelaine to wear around your neck. Scissor case does not include the scissors, scissors must be purchased separately. 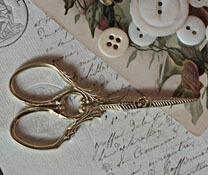 3 1/2" gold plated scissors embellished with winding vine engravings...lovely! 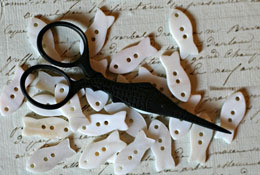 3 1/2" primitive black scissors embellished with winding vine engravings...they look just like antiques! How cute are these? Tiny 3 1/2" silver embroidery scissors in the shape of a swordfish. Everyone needs a pair of fish scissors in their collection! How cute are these...and these fish don't even stink! Tiny 3 1/2" primitive black embroidery scissors in the shape of a swordfish. 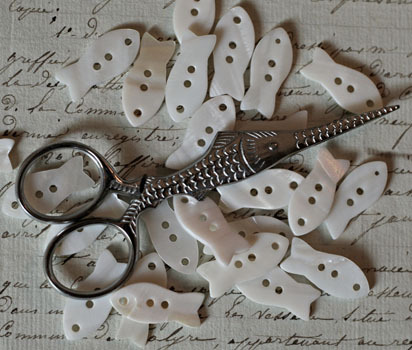 Everyone needs a pair of fish scissors in their collection! 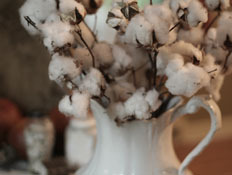 A 24 - 30" stalk of cotton bolls. The cotton plant is just a truly amazing work of nature...the beginning of a fiber that we've all grown to love and wear! Tuck into an old vase or pitcher for a wonderfully prim accent. Two stalks are shown in the pitcher in the above photo. 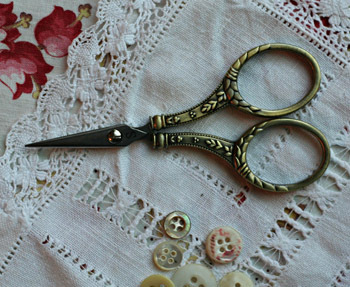 3 3/4" Victorian styled scissors from Italy. Stainless steel blades with a lifetime guarantee. 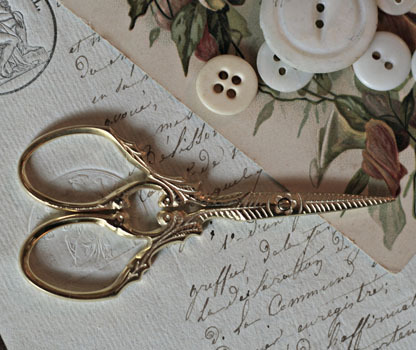 4" elegant European styled scissors. High quality, stainless steel blades...perfect for cross stitch, embroidery, sewing & quilting.